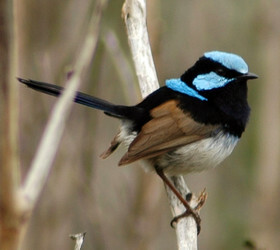 Meliphagoidea consists of Maluridae (fairy wrens), Meliphagidae (Honeyeaters), Pardalotidae (pardalotes), Acanthizidae (scrub-birds, thornbills), and Dasyornis (bristleheads) (Cracraft and Feinstein 2000; Barker et al. 2002, 2004) and is sister to the remaining oscines (Barker et al. 2002, 2004; Beresford et al. 2005). Cracraft, J., and J. Feinstein. 2000. 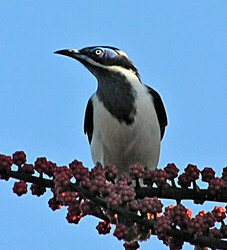 What is not a bird of paradise? Molecular and morphological evidence places Macgregoria in the Meliphagidae and the Cnemophilinae near the base of the corvoid tree. Proc. R. Soc. Lond. B 267:233-241. 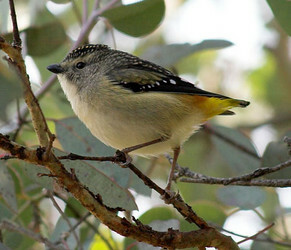 Female Spotted Pardalote sitting in a street tree in Canberra.